The Moon is a great target for astrophotography. 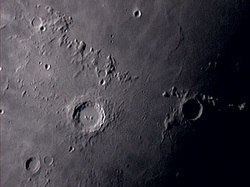 There are numerous craters, mountains and other features that can easily be imaged with a web cam. As the phases of the Moon change the lighting on these targets shows details that change with the lighting. There are challenging features to attempt to image at all focal lengths. Click on the image on the left to see a few of my results with various cameras and telescopes. 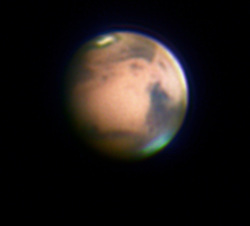 Mars is a favorite imaging target for many astrophotographers. Mars is the only planet that surface features can be captured by amateur astrophotographers. As a result of the orbits of Earth and Mars, Mars is only visible for imaging every other year. In addition the angular size of Mars varies from appearance to appearance because of the elliptical shape of Mars orbit. In 2003 Mars was the closest and largest in appearance that it will be for many years. Check out my images from the current opposition and from the 2003 opposition by clicking on the image to the left. The cloud features of Jupiter are constantly changing. Detecting and tracking these changes is a favorite goal for amateur planetary imagers. The Great Red Spot, visible in the image on the left, is a constant feature that has been present in the Jupiter atmosphere for over 400 years. 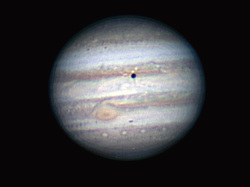 Another aspect of imaging Jupiter are the four major moons of Jupiter. As the moons pass in front of Jupiter, frequently they will cast their shadows on the cloud surface. The image on the left shows a transit of the moon Io. Click on the image on the left to see this and other examples of Jupiter images. Saturn is one of the most beautiful objects in the night sky to view through a telescope. The inclination of the rings change from year to year. Occasionally large storms will erupt in the Saturn atmosphere that will be visible by amateur imagers. 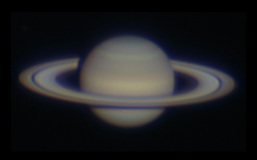 Saturn is a particular challenge for amateur planetary imagers due to the low surface brightness. Click on the image on the left to see images of Saturn that I have made with various equipment combinations.